YOU CALL IT a “one great leap” when you have successfully transitioned from tobacco to electronic cigarette smoking. Why? With the addicting effect of the high nicotine content found in tobacco, leaving the conventional way of smoking does not take overnight. And while puffing on a disposable e-cigarette does feel like holding the traditional cigarette stick, the sensation is entirely different. Smell great again as you dispose of the tobacco and embrace the art of vaping. Since burning and vaporizing are entirely different, they also result differently, and hence, smell differently. When you puff from your tobacco, the smoke will get into your clothes, hair and even in the curtains at your home, resulting into an acrid and awful kind of smell. A terrible smell will also remain in your breath. Bye bye, scaly and rough skin! The toxins burned from the cigarette may go with its smoke out into the air, with the bigger percentage of touching your skin. Furthermore, traditional smoking slowly kills both the lungs and the liver, among other organs in the body, and when the liver is affected, so is your skin. Whatever is the condition of your liver will reflect on your skin. So if your liver is choking from too much cigarette smoke, then you will notice the effect on your skin as you notice the lack of moisture in it, producing a dull and unhealthy skin. Your gums will not progress any further in turning too dark if you stop smoking and go into vaping instead. You might not be able to entirely get back those red or pinkish gums (well, it depends on how long you have been using tobacco) but at least they won’t go black any time soon with vaping. Hence, losing some habits and certain practices in our lives is not that bad after all especially when you lose that bad habit to a better way of living. 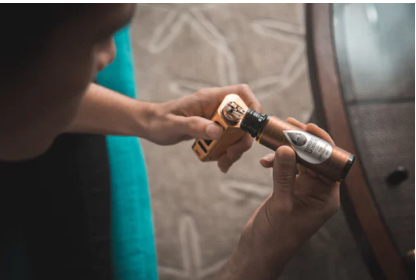 E-Cigarette Liquid Ingredients: Safe or Septic?